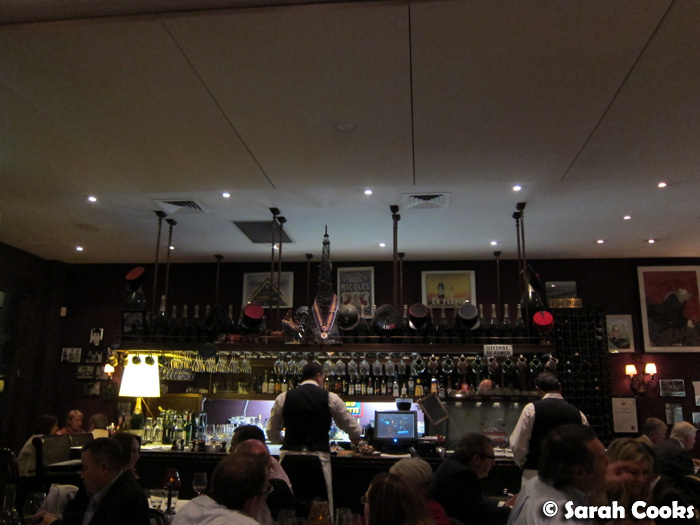 As I mentioned in my last post, it was my birthday on Monday, and we celebrated with dinner at Bistro Thierry. I'd never been before, but had driven past it dozens of times, and it came very highly recommended by a foodie ex-coworker of mine. It's a small restaurant on a posh stretch of Malvern Road, and seems to be incredibly popular - despite it being a Monday night, it was packed! The decor is OTT stereotypical "Parisian", in that romanticised, exaggerated way that us non-Parisians imagine Paris to be - I felt a bit like I was in an episode of 'Allo 'Allo. "I will say this only once..."
First thing - soft drinks were ridiculously overpriced. We ordered a $4 coke, which I felt was standard restaurant pricing... until it came out and I saw it was a tiny bottle, less than 200ml. Almost half the size of a normal restaurant serve of soft drink! Not cool! Second thing - all the tables in the restaurant were placed very close together, which did go towards creating a convivial atmosphere, but wasn't particularly comfortable. In fact, it was downright cramped! We had waiters bump into us a couple of times while we were trying to enjoy our meal, and also had to lean out of the way when the table next to us was being served, without so much as an "excuse me" from the waiters. It also meant the restaurant was very noisy, so it was quite hard to have a conversation without yelling. If, like me, you are bothered by noise in a restaurant, I'd ordinarily recommend visiting on a quieter night, but as I mentioned above, the place was full even on a Monday night! I don't think they have "quiet" nights. So, just give in and enjoy yourself! Now, the food. Good, crusty pieces of baguette were provided to nibble on. My dad and I shared a half-bottle of wine. 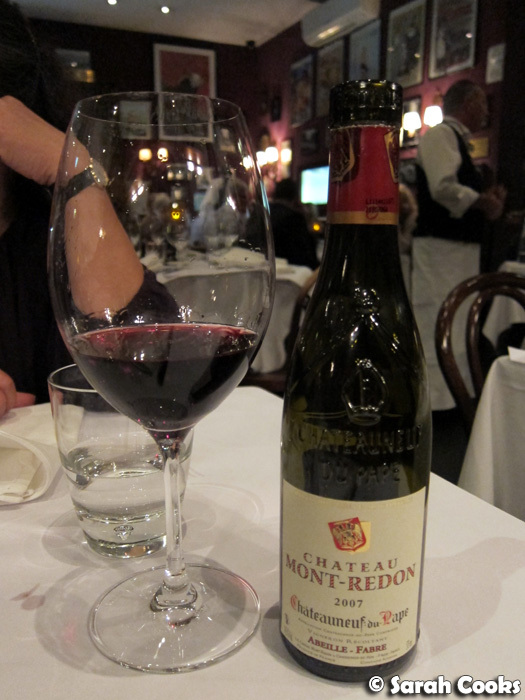 I love it when half-bottles are available at restaurants - a whole bottle shared between two always seems quite excessive to me. 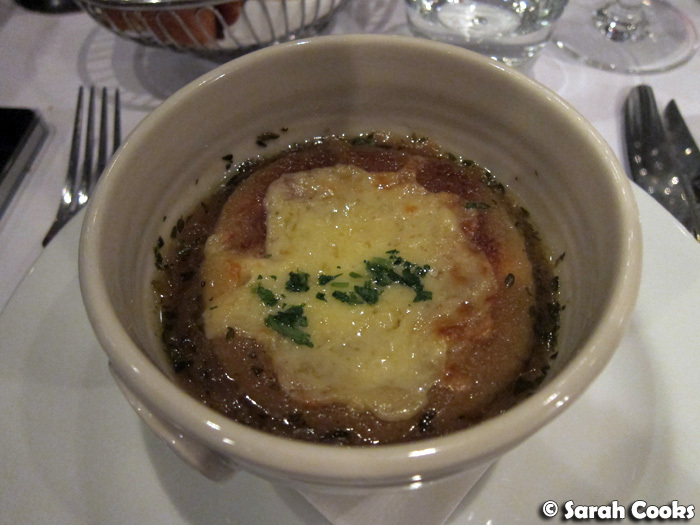 Sandra and I shared a French onion soup as an entree. I thought we'd get one bowl and two spoons, but they actually generously split the soup between two bowls, and gave each of us a Gruyère crouton, with no extra charge. (My mum ordered a bowl for herself, and unlike my bowl, below, hers was filled closer to the top). 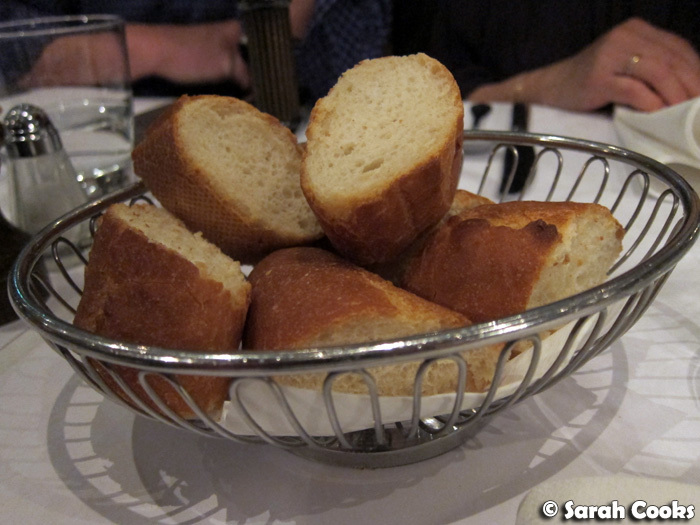 It was quite salty, but not too rich - a nice way to start the meal. 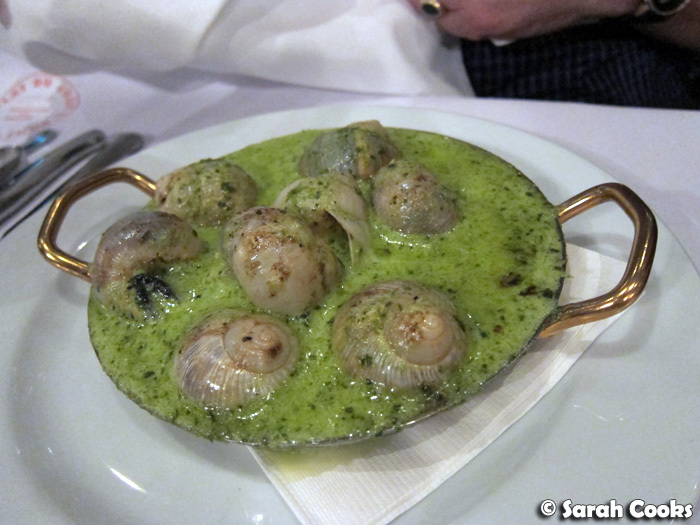 My dad couldn't go past the escargots, which came out attractively presented in a cute metal pan. 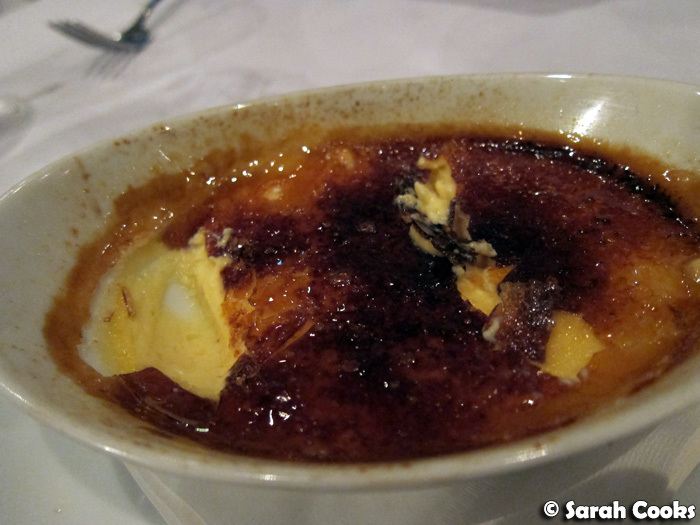 Although he enjoyed them, he did mention that they were a bit too buttery and rich, and thinks Philippe Mouchel's escargots are still the best. Mum's main of roast chicken was impressive, the white asparagus and micro herbs lifting what would otherwise have been a uniformly brown dish. 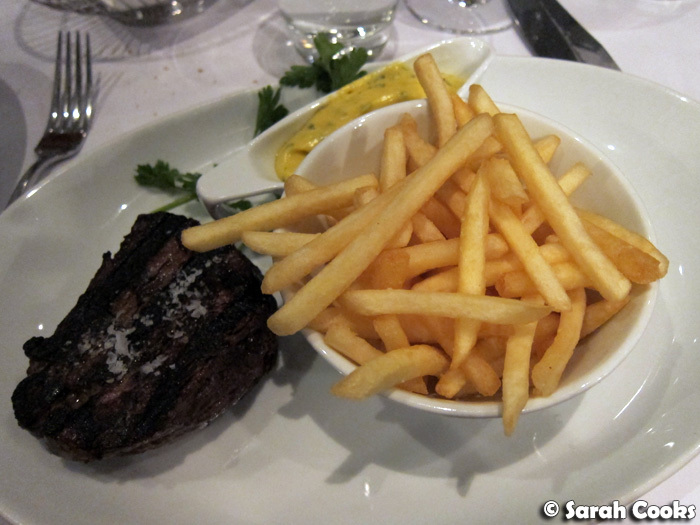 Three of us ordered the steak frites, and I'm ecstatic to say that they all came out perfectly! Sandra's was "very well done", Dad's was "rare", and mine had to be: "very, very rare please!". My "very, very rare" steak was done exactly the way I like it, with a charred, almost crispy exterior encasing the soft, gorgeous rare meat within. I chose the classic Béarnaise sauce, which I love, but only added in tiny amounts. Having made it myself a few times, I know just how much butter goes into it! Below I have a picture of the contrast between well done and very rare - both perfectly done. 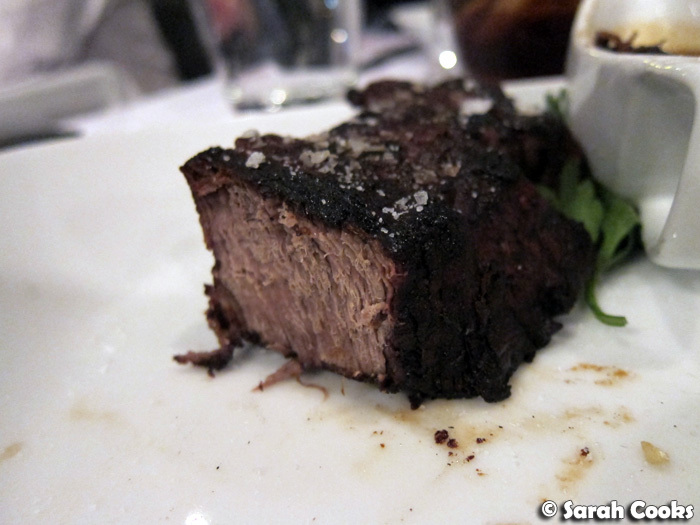 The first time I visited Bistro Guillaume in Crown in 2008 (back when it was where Spice Temple is now), they cooked my steak perfectly, but when we visited again after it had moved and re-opened in its current, more casual incarnation, they cooked my steak medium despite my being clear that I wanted it very rare. 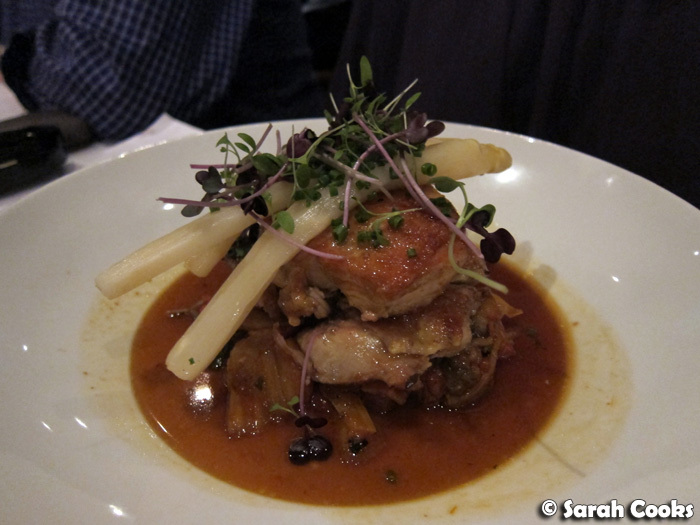 (In fact, that visit to the new Bistro Guillaume was so underwhelming that I didn't even bother to blog about it). Last year, that stalwart of Australian fine dining, The Lake House, undercooked Sandra's "very well done" steak, despite the fact that our waitress suggested a particular steak dish that would suit that type of cooking. Even when we sent it back it still came out medium-rare. Why... why! Well-done steaks make me cry inside, but Sandra likes them, and this one was cooked just as she requested - fantastic. 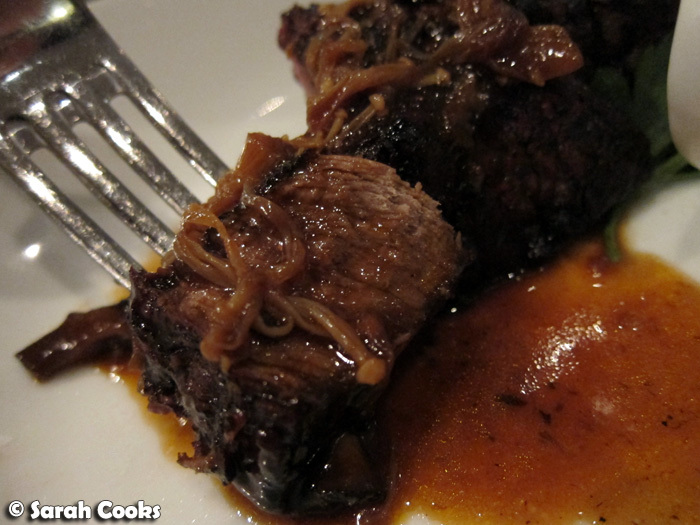 The mushroom sauce that accompanied Sandra's steak was a world away from the bland, creamy button-mushroom sauces served in lesser steakhouses. With a mixture of exotic mushrooms (including the enoki that you see above), it was a clear, intensely savoury sauce, almost tasting like a soy sauce. I would say that it tasted "umami", but I loathe the overuse of that word! 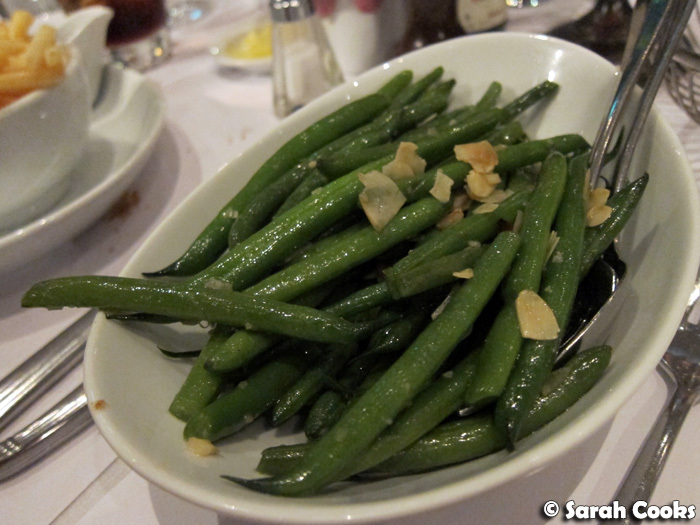 To go with those big old steaks, we ordered some green beans. Again, these were cooked the way I like them - softer than al dente - with lots of tasty garlic butter. Ordinarily I would have skipped dessert, but it was my birthday after all! 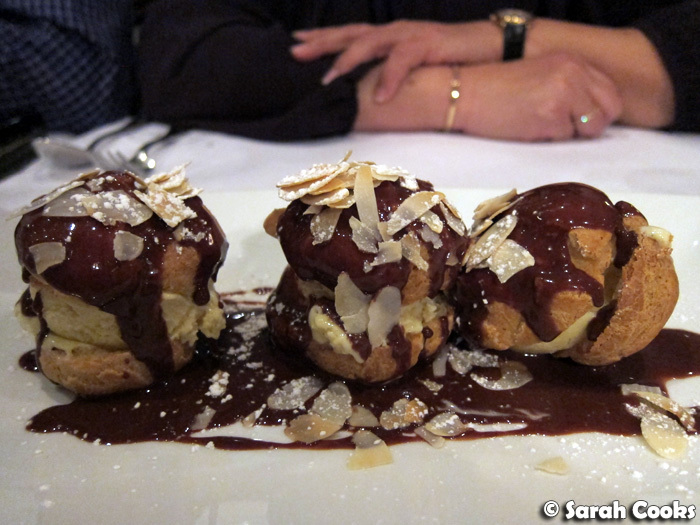 We ordered a crème brûlée and a serve of profiteroles to share between the four of us. What can I say about the desserts? Just that they were classics, executed very well. This appears to be the overriding theme of the restaurant. 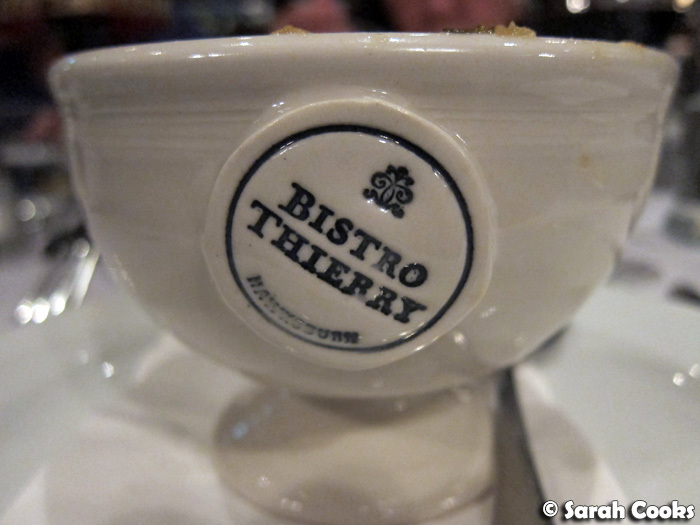 Despite the minor quibbles that I mentioned, overall we loved Bistro Thierry and had a great evening there. 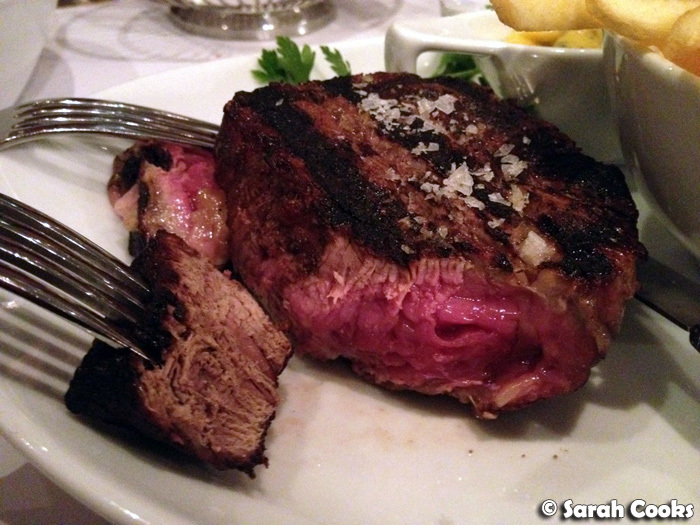 Any restaurant that can do steaks right gets a big tick in my book! I look forward to going back one day. 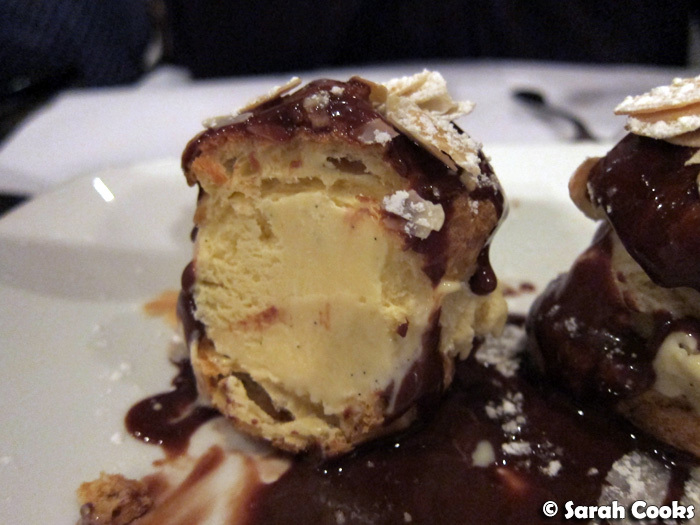 It has been a long time since I've been to Bistro Thierry, but the photos of those steaks and the profiteroles are tempting me back. How long did your dinner take? Myself and a few friends have found that you can be in and out of the restaurant within an hour. Which is a shame when you want to take your time. Omg the steaks were AMAZING! Although I'm sure you picked that up from my post, lol! The steaks look great! Well done steaks make me cry too (well you know what I mean :P) and I find sometimes that they err on the side of too cooked as I like it medium rare.